I was taken completely by surprise when I started reading this series. I’m not a huge reader of PNR and so didn’t know what to expect. 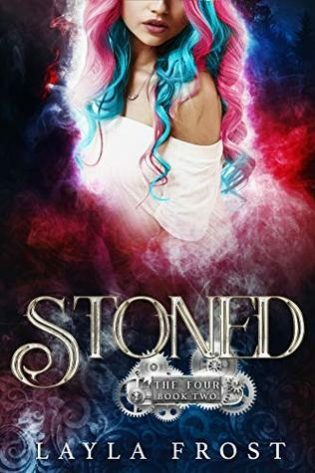 I enjoyed book one, Styx, but I absolutely loved Stoned. I will admit to being a little confused at the beginning and had to refer back to book one to get my bearings. I appreciate that Stoned picks up where Styx left off, but a little catch up at the beginning I think would have helped. In keeping with the overall theme of the book, in my head I was imagining this in a sort of tv voice-over “Previously on …” kind of way! The whole storyline is so fabulously unique in its retelling of a certain ancient tale, that once I got into the swing of things again, I couldn’t put it down. Oh Juno, how I loved her. Her strength of character, her quirkinesses, her foul mouth and witty one liners had me in stitches. I wish her “nerdtastic” stores existed on my local high street. With books and comics (sometimes of the special variety – I’ll leave you to discover those for yourself! ), coffee and board games, not to mention cotton candy served by the hysterically self titled “prematurely expired”, I’d never want to leave. I also really enjoyed the insight into Juno’s history, told in such a way that enhanced, rather than interrupted, the flow of the story and made her even more endearing, if that were possible. Fantastically steamy moments and alpha growliness are provided courtesy of the wonderfully named detective Stellan Reddick, from whom Juno is keeping one heck of a big secret (or two). As well as all the fun and magicks, there’s some mystery and suspense going on, together with a smidge of danger, and an important quest, which is really the whole premise of the series. Although each book concentrates on a different couple/character, they are interconnected and the story arc continues from the previous book. Because of this, I would recommend you read them in order. This series is my first read of anything by this author and I love her writing style, her inventive storyline and her humour. My advice would be to throw all your preconceived and stereotypical ideas of witches, and of angels and devils out of the window, suspend your disbelief and dive right in. I did and I loved it. Good review, seems like an interesting series. Thanks for sharing your review. I just got these.